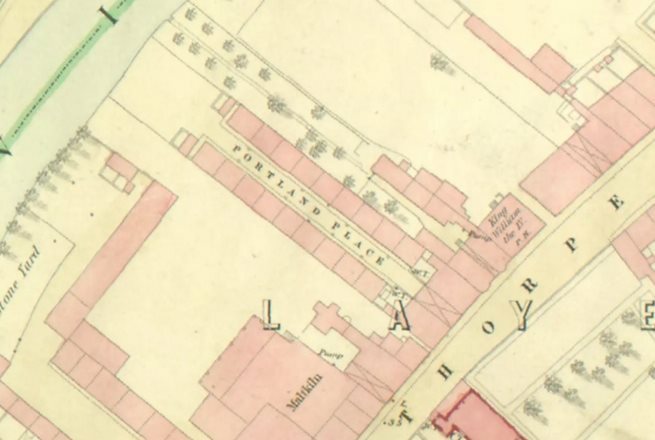 Portland Place was accessed via a passage on the main Layerthorpe Road and was the 3rd yard on the left hand side, walking from Layerthorpe Bridge (John Bull Yard and Chickory Yard being the 1st and 2nd respectively, in 1909). 10 Portland Place was built in 1849. It was a 3 roomed house situated at the bottom of the yard, on the right hand side: beyond it was a wall which seperated it from the shallow river bank. My ancestors who resided at the house in Portland Place were; George Casper (born 1848, died 23rd May 1912 York Union Workhouse); Mary Casper (nee Davis, b1848, d10th December 1909 York Union Workhouse): my great grandparents. Their children; George Henry Casper (b1875, d1951 York); Thomas William Casper (b1880, d1910 York); Lily Casper (b1882, d1908 10 Portland Place); Charlotte Casper (b1885, d1956 York); Peter Casper (b1888, d1950 York); Annie Casper (my gran, b1892, d1946); and also my grandad, William Richard Gray (b1887, d1974). In 1907 there were 9 family members living in 3 rooms in Portland Place.